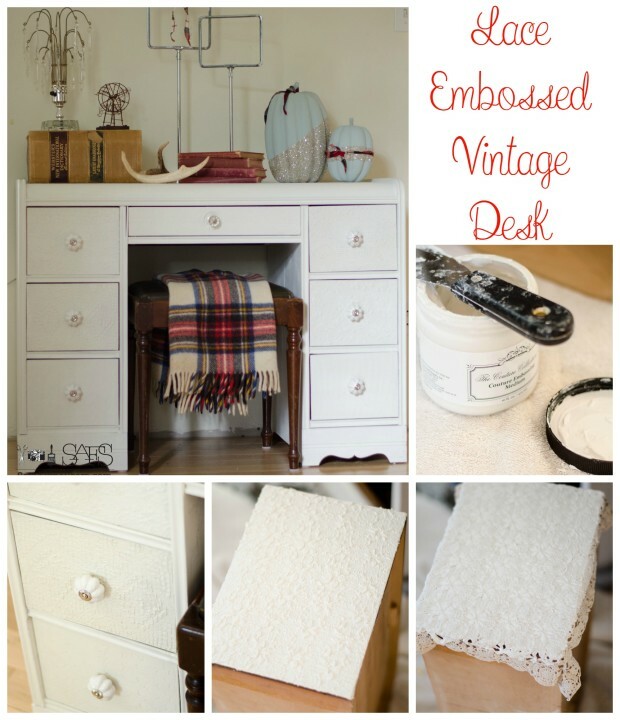 Lace Embossing a Vintage Desk. Yes you read that right! This technique is one I absolutely love and I finally applied it to a piece of furniture. I learned this in paint training when I signed up with Paint Couture last Spring and I’ve wanted to do it on furniture ever since. It’s really a very easy technique, it just takes some lace, some Paint Couture Embossing Medium, and a bit of time. This is the before of the desk. It belonged to my Grandma and I never paid much attention to it except to open the drawers that held the little toys she kept there. When we were cleaning out her house I decided I could make this nondescript desk look amazing so I my husband hauled it home. It doesn’t look too bad in this photo, but up close you can see that it is a very inexpensive piece, some of the veneer was warping, and the drawer pulls are ugly in my opinion. 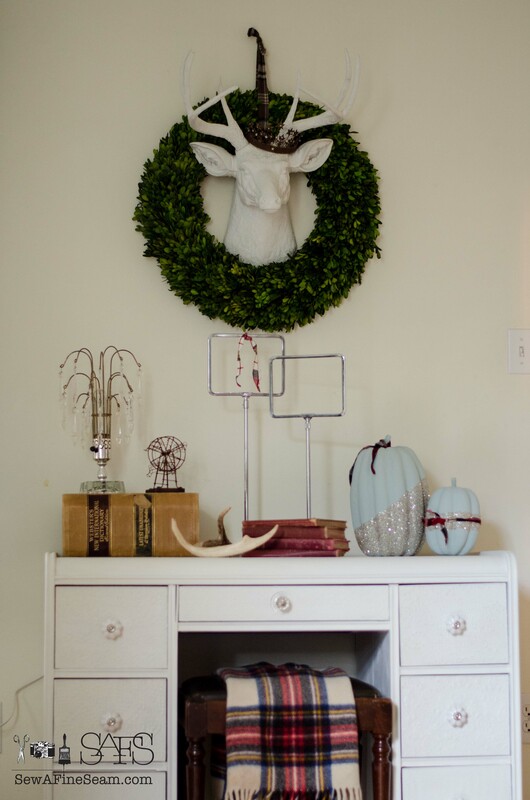 In this photo I was trying out some fall decor, deciding on a vignette before painting my paper mache pumpkins. I decided it was time to dig in and get the desk painted. I gave the desk two coats of white paint, and as I painted I realized more and more the poor shape the desk was in. Someone, at some point, had refinished it and added about 4 layers of shellack. There were runs in the finish and as you can see in this photo there are cracks between the joints of the top. 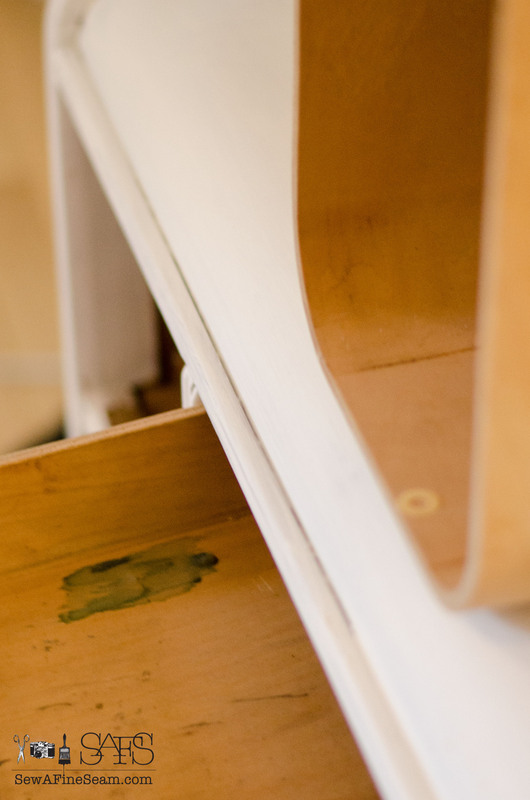 The drawer fronts were not looking nice at all either. So I pulled out my embossing medium and went to work. I filled in all the cracks I with the embossing medium, just smoothing it in with my finger like you would use caulk. Here is after filling the crack in with embossing medium. The embossing medium has a consistency a lot like drywall spackle. 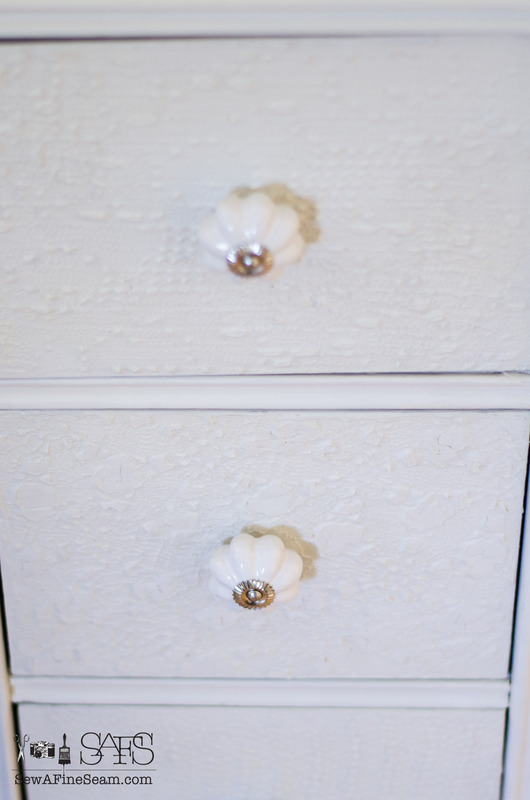 It dries super hard and works great to fill cracks, and to create the lace embossing on the drawer fronts. 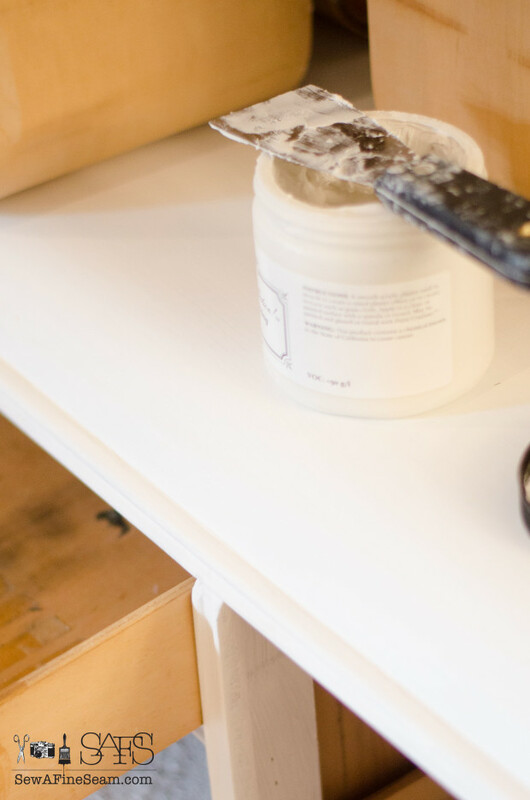 Using my putty knife I put a layer of the embossing medium on the front of a drawer. I covered the drawer completely but didn’t try to make it even or overly neat. Just got it on there! 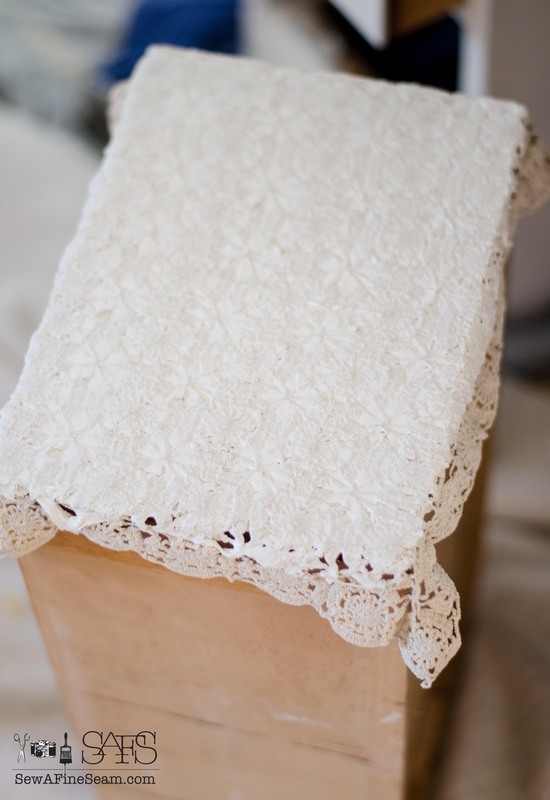 Then I placed my lace on top and gently pushed it down into the embossing medium, pulling it taut across the top. 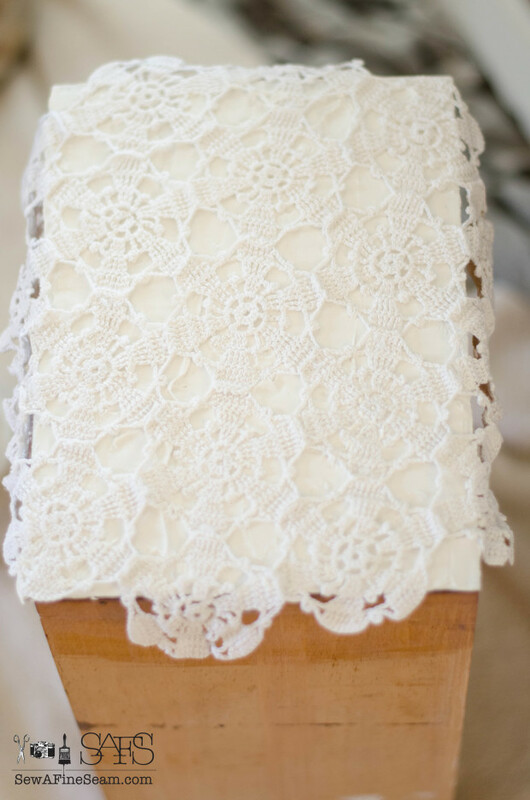 I used old crotcheted lace doilies in varying patterns. I’ve picked these up at garage sales and thrift shops for next to nothing. More embossing medium was added to the top of the lace, making sure the holes of the lace were filled. Using the putty knife I scraped as much excess embossing medium off the top as I could, working gently and not moving the lace much at all. It needs to stay put to create the best design. When the lace is lifted of the design stays behind! I let it dry overnight and most of it was completely dry and hard. One of the designs was thicker and had larger raised areas and it was set but not completely hardened. 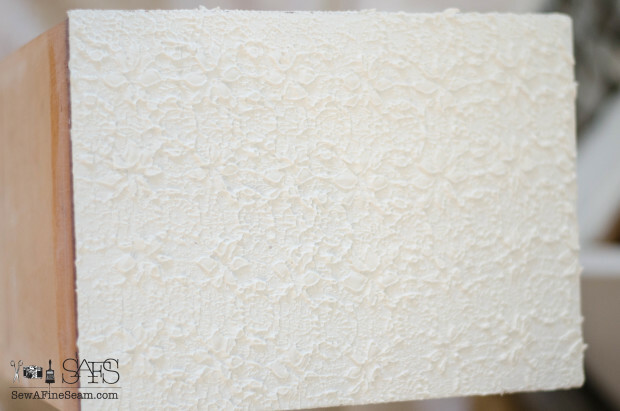 The larger, thicker areas can crack a little but typically you will paint over the embossing medium so those little cracks won’t show up. Each drawer is a different lace design. I added another coat of paint over the whole desk and then used a Lime Wash glaze to give it a finish. Because I was glazing white over white I just put the glaze on with a brush and it created a wonderful finish for the piece. Usually you put a glaze on and then rub some back off with a sponge or cloth to create the look you want. I added the white drawer pulls to the side drawers but I decided to add a bit of quirky fun and put a large glass knob on the center drawer. 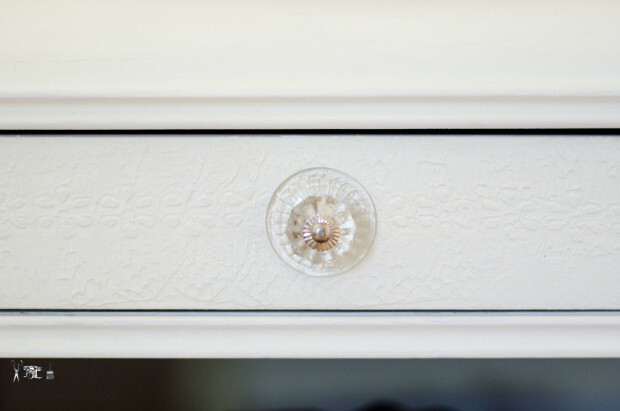 I’m loving the textures of the lace embossing medium and the knobs. It doesn’t look like the same desk and I absolutely love it all white! It makes me happy that this piece is now white. I know a lot of people have a fit when any wood gets painted. But this is mine, and I wanted it white. I like it white. I think it looks much better now. 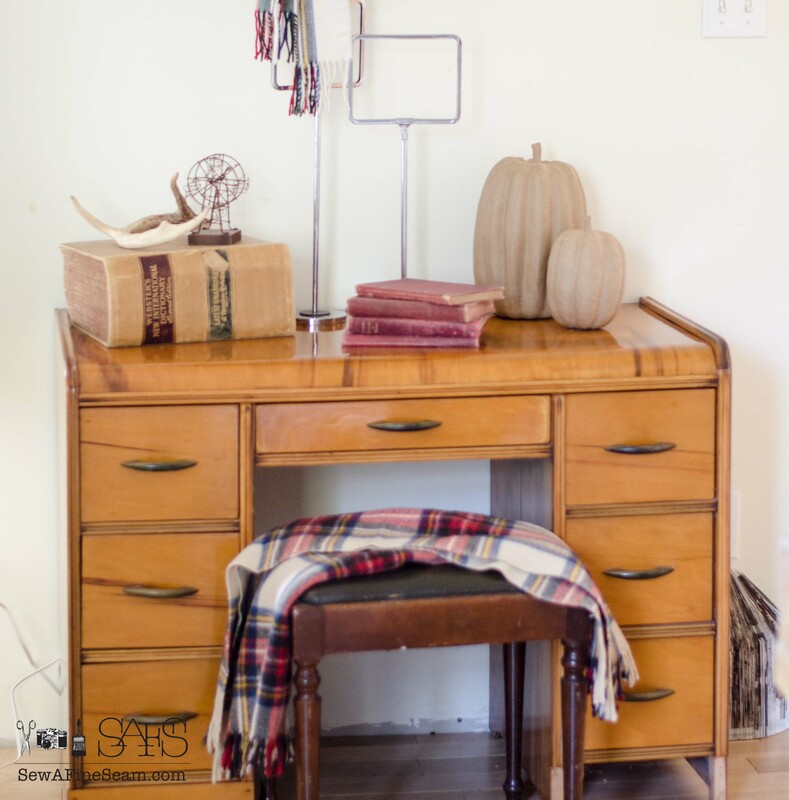 😀 My fall vignette turned out even better than I hoped. 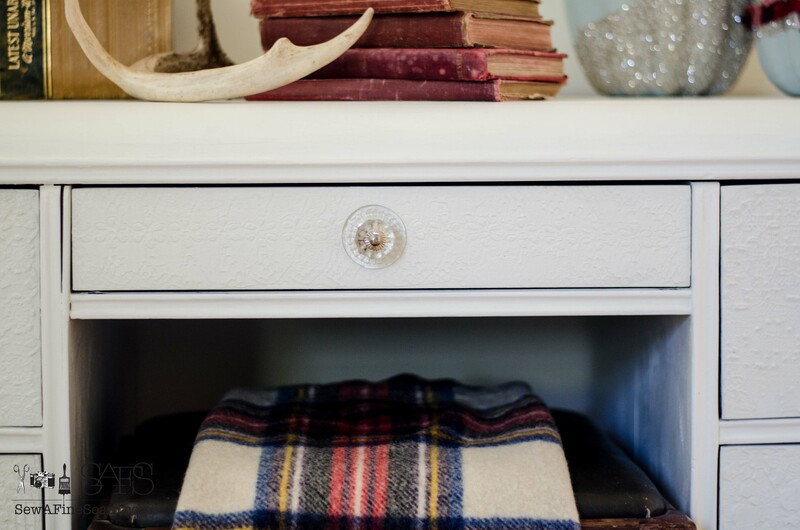 I had planned to paint the little stool too, but once the desk was painted white I rather liked the contrast of the dark stool and it looked good with the plaid. So for now it stays dark. (I ran out of time too!) The stool will eventually get a makeover too, but I don’t look at this space every day now and wish the desk was painted like I used to! I wonder what my Grandma would have to say? I’m sure she would be glad that someone was getting some use out of her things. As for the makeover – you just never knew about my Grandma! She may have liked it, she may have said nothing at all about it! Ahhhh. Love that after! I’m also thrilled that the missing piece of trim in the before photo was tucked in the bottom drawer just waiting for me to pull it out and nail it back in place. The desk is filled with books and my teenagers jewelry making supplies. 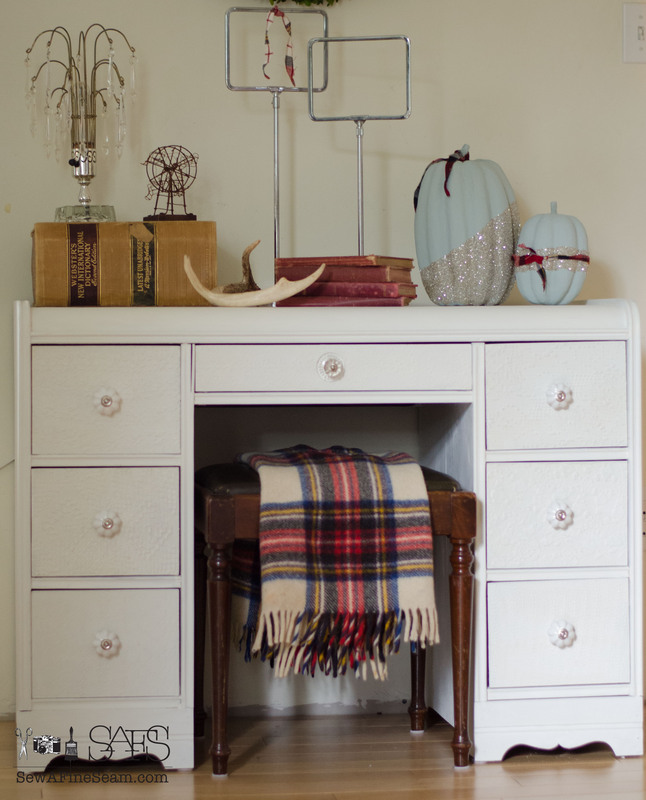 It’s nice to have a space to tuck things away out-of-site. 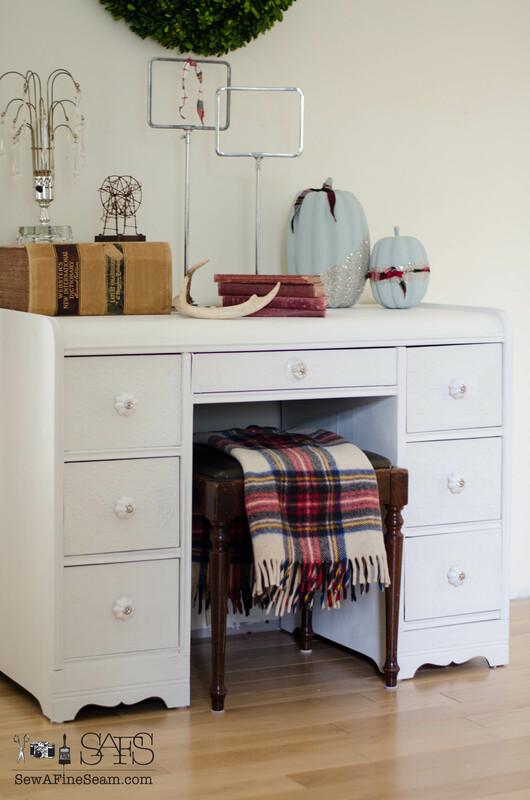 What would you store in this desk if it were yours? Thanks so much Kathleen! I forgot to say in the post that I rinse the doilies/lace out after using them and then throw them in the laundry so the can be used again. I soak and rinse them in a bucket and then dump the water in the driveway. 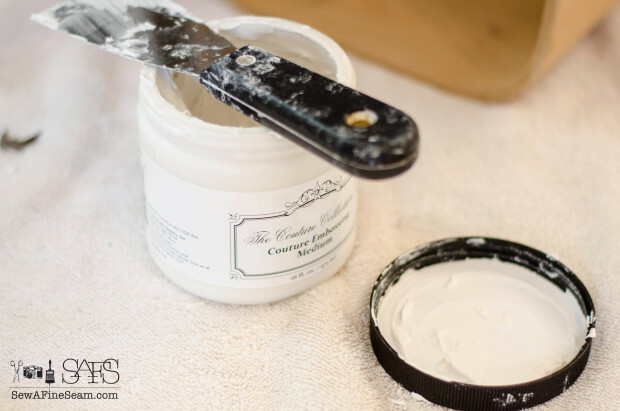 You want to get as much of the embossing medium out of them as possible before rinsing under the faucet – the embossing medium dries so hard you don’t want to get it in the drains! 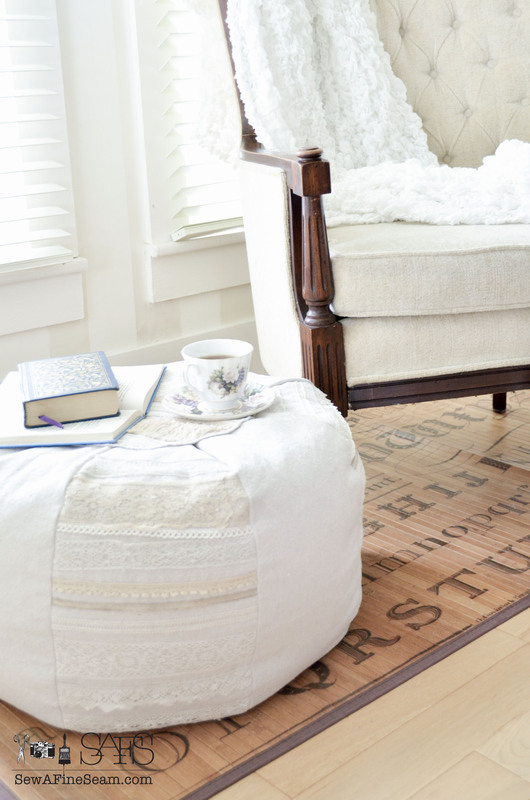 Sounds like a great way to use this space Donna! 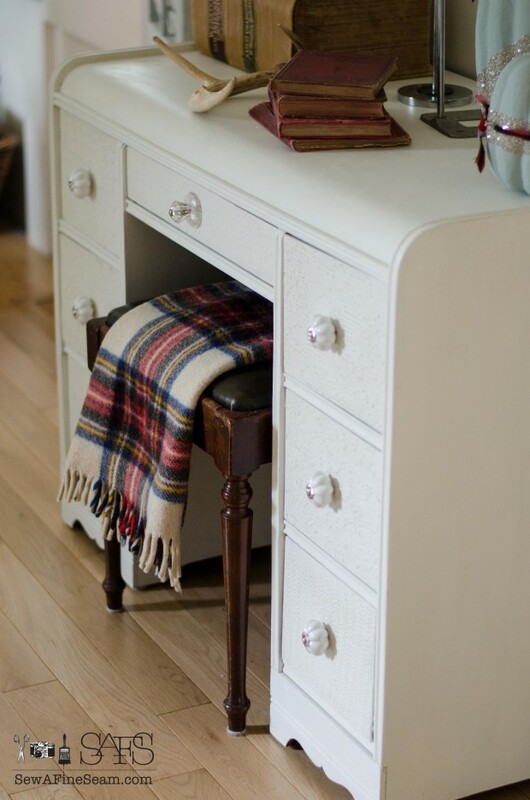 This desk is so perfect for the space – the footprint is small enough to not overwhelm the area but the drawers are deep and hold a lot! Hi Jill. Great way to update a desk. I have done similar and I love the way it turned out! I sent you an email. Please let me know what is happening there. I’m dumbfounded! Absolutely love the transformation! 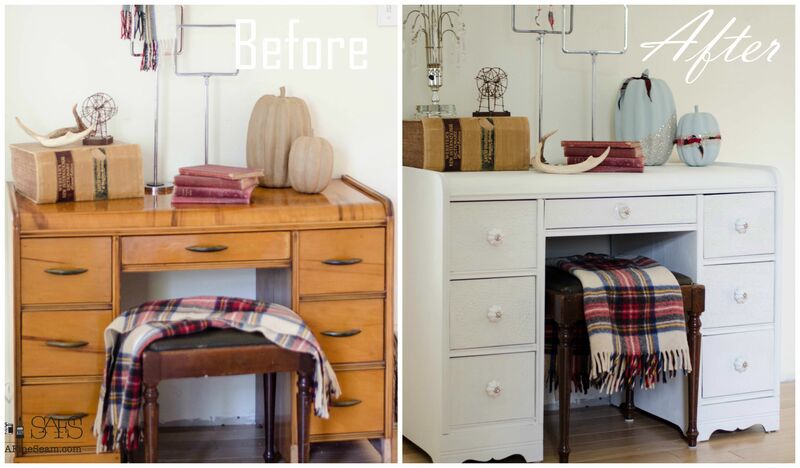 I have an old desk that I used growing up and you have inspired me to give it a “new” look! Thanks!! Thanks Cathy! 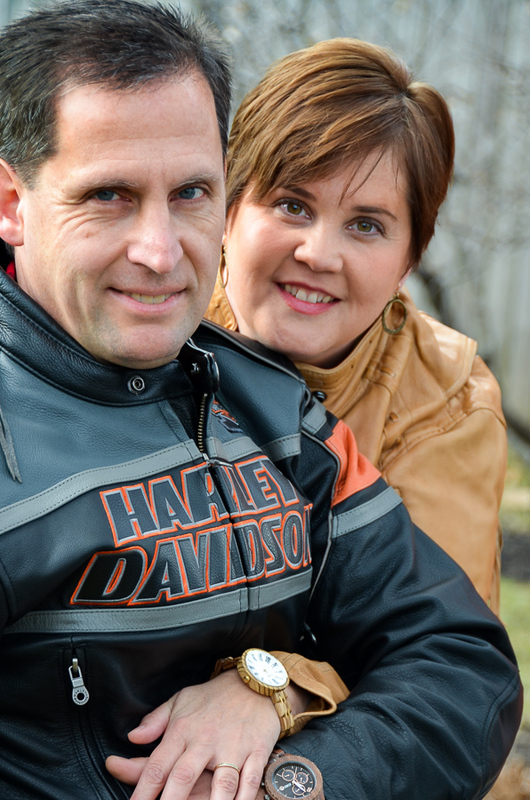 Have fun with your makeover – it makes me happy that what I do can inspire others! I don’t know what Grandma would say about the transformation of her desk but I say that I never would have guessed it could look this pretty! I know, it’s hard to believe it’s the same desk! And you never know what Grandma would have said! Thanks Lisa, it was really fun to work on and I love to do the lace embossing! Looks great. I love the white color. The desk looks so cute. I love the way you use the lace in painting. Thanks. Yes the chair does need painted! It’s on the list of makeovers!